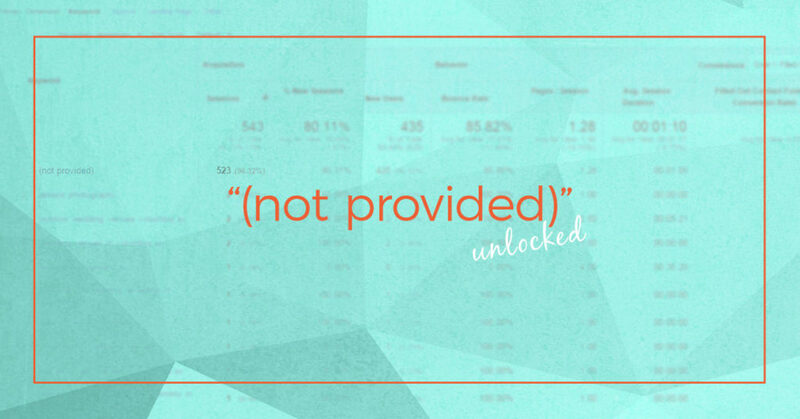 If you’ve ever used Google Analytics and tried to figure out which keywords people are using to find your site, you’ve probably encountered the frustrating “(not provided)” keyword. In fact, this accounts for almost 100% of traffic on most of my sites, and probably yours too! This data is hidden for all searchers using a secure browsing session, which is now default for all users. But don’t you worry! I’m going to show you a simple trick to get tons of information back about the queries people are using to find your site! First, you’ll need to set up Google Search Console. In fact, once you do that, you’ll be able to access the keyword report already. You’ll even have access to historical data, even when GSC wasn’t set up on your site! But I’m going to show you how you can connect GSC to Google Analytics and have the reports all in one place! You’ll be prompted to set up search console data sharing. Click that button. Scroll down to the bottom and click the “Adjust Search Console” button. Then click the “Edit” link. Sign in. Make sure you’re signed in with the same account as your Analytics or it will give you problems. The last step is to choose the domain to associate with the Analytics account. Notice that I have both the www and non-www version of my site in Search Console, but my rel:canonical is set to the www version (and this is also my preferred domain in GSC), so I’ll choose that one! Now lets go back to Google Analytics. Head back to the Queries report page. Nice! Now we have unlocked about 50% (your results may vary) of the keywords used to find our site! NOTE: Make sure to show more rows or view multiple pages, the default is to only show you 10 on a page. And just in case you were wondering… Yes. I currently rank on page 5 for the search term “your bed is on fire with passionate love.” LOL! The things kids search these days. This information is valuable because it lets you get inside your visitors’ heads! You can see how people are searching, and you’ll know what kind of content you should expand. It should also help you brainstorm ideas for new content! Now that you have this set up, you can also easily see which page people have been landing on from organic search. So even that 49% that I couldn’t see before… I can find out which page they landed on, which gives me a hint about what type of query they used. Clicks: The number clicks on your website URLs from a Google Search results page. Average Position: The average ranking of your website URLs for the query. CTR: Click through rate = Clicks / Impressions * 100. *None of these include Adwords results. A really low CTR may indicate that your site is showing up in search engines, but users are not interested in clicking the results. Google takes note of this (not necessarily through these analytics, but through other data sources), so this is a number you should always strive to be increasing by making your snippets more clickable! Want more SEO tips and ideas? 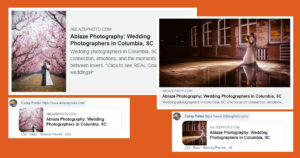 Join the FYP Facebook group for daily SEO and online marketing ideas for photographers! Such a great post! I am going to set this up now =) Thank you for sharing this tip! What a helpful step by step for improving use of Google analytics! I clearly need to improve my snippets to make my links in searches more clickable! Thank you thats super helpful Im always confused about SEO’s because they are every changing and I’m always wanting to learn more to help my website. Ridiculously helpful! Just the answers I’ve been scouring Google for! Thank you! Corey, I’m going to be diving into this with my team in the next few weeks. THANK YOU so much! YES!!! This is SO helpful!! Thanks for sharing!! Hello hello 🙂 I went through the steps and have the Queries reporting unlocked for the domain I’m looking at, but there is zero data showing. I’m currently #1-3 for most of my keywords, so I’m surprised it isn’t showing anything, any suggestions? Thank you! My best guess is that it will take a little time to populate. If there is no data after a week, check search console. If there is nothing there, maybe there isn’t enough search volume for your keywords in the time period you are checking.